I don't think much explanation is needed for this card except that the "table" line was drawn in with a pen and ruler and the little "hello" is from the Papertrey Ink set Mixed Messages. Looking through my past entries made me realize that PTI has become my go-to whenever I want just the right sentiment, whether it's because of the font, size, or actual words. In this case, I really wanted a tiny little sentiment that could fit onto the oval and I thought this "hello" was perfect. BTW, I know that in reality you would be able to see the table edge through the glass vase, but I just couldn't figure out how to draw it without it looking weird. Believe me, I tried a lot of different options and ruined them all! So, I took a little artistic license and just put the lines around the vase. Even though we moved into our new house way over a year ago, I still haven't unpacked all my craft stuff!! (Yes, I have way too much stuff!) So I was going through some boxes and came across a bunch of stamps I forgot I had! 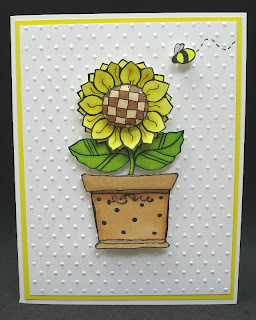 This sunflower image is from Penny Black and I got really excited when I found it because I could color with my Copics and do a bit of paper tole! The little bee is from My Favorite Things. It's in the Bundles of Bouquets set and I think it's just the cutest little thing! I stamped the image 3 times to get all the layering I wanted. You can see from the close-up picture that I popped up the whole flower head (and offset it so it looks like the flower has more petals), and then just the center. I did just a tiny bit of shaping for even more dimension - curled the edges of the top layer of petals and then made the center somewhat rounded. It's a little hard to see, but I also popped up the top and bottom rims of the pot. For those, I just put a few layers of scrap cardstock underneath so they wouldn't stick up too much. And then I put the entire thing on foam tape so it would float over the dotted background (sorry for over using the Swiss Dots background but I just adore the way it looks!!). My hubby wanted a thank you card for a male co-worker so I pulled out my brand new Gel-a-tins set Pet Shop (which I've been wanting *forever* and couldn't find until just recently!) 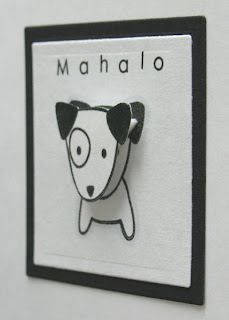 because I know he's a dog lover and because I don't have a lot of male-friendly stamps! I decided to keep it very clean and simple so I just matted the focal image on a bigger square of black cardstock and that was it! I have to admit that I really love this card and will probably make more of them soon! 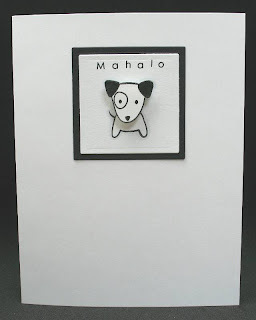 Other materials used: white cardstock - Georgia Pacific; black cardstock - Stampin' Up! ; Graphite Black Brilliance Ink - Tsukineko; square Nestabilities. Little notes: I did some sewing which doesn't show up too well unless you enlarge, and also I airbrushed the sky and the light part of the grass. I did mask the flower, leaves and Changito's body, but not his hands or feet. I knew that I would be coloring them with a dark brown that would go right over the blue and green airbrushing. The reason why I masked his body was because I wasn't sure that light brown color was dark enough to cover. I also didn't bother masking the line between the grass and sky so that they would blend nicely together. Lastly, I drew in a few blades of grass to extend that line to the edges of the rectangle. Thanks to Amy for another cool sketch! Materials used: Changito Thank U - Stampendous; white cardstock - Georgia Pacific; patterned paper - My Mind's Eye; Swiss Dots embossing folder - Cuttlebug; Copic markers and airbrush; ribbon - May Arts; Nestabilities. 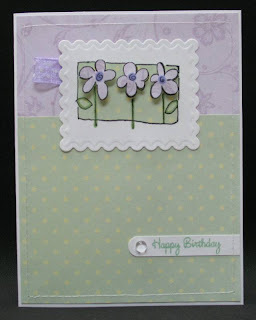 For today’s post, I have another set of 3 cards that I made following this post by Cindy Lyles. I ended up using just a wee bit more than 2 6”x6” sheets of patterned paper because I did paper piecing for my focal image, but not much more. The truth is that I actually started with 2 12”x12” sheets of PP so I had a lot left over. BUT I’m planning on making a bunch more of these cards to use up the rest of the sheets. 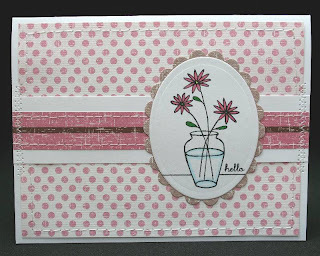 You can see that I put my cards together just a little differently than Cindy – I added the word window punch strips with my sentiment because it didn’t fit very well on the focal block, I changed the direction of the card with the PP strips, and I added stitching on all the cards. Yes, all the extra elements, including the paper piecing, do slow down the process (which was one of Cindy’s main points for this system), but I wasn’t as concerned with the time factor. 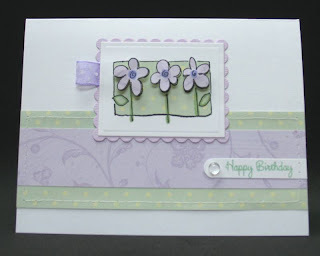 For me, just getting more than 1 card done is a sitting is a major time saver, so Cindy’s mission was still accomplished! Little details: I added some interest by coloring just a bit with my Copics – the leaves, stems, and centers of the flowers, and I popped up my flowers with foam tape for dimension. 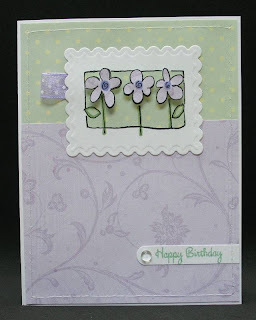 Materials used: flower stamp from Printworks – Sweet Pea set; sentiment stamp from Hanna Stamps! ; white cardstock from Georgia Pacific; purple cardstock from Bazzill; patterned paper from K&Company; black Brilliance ink from Tsukineko; mint ink and word window punch from Stampin’ Up! ; markers from Copic; ribbon from May Arts; Nestabilities from Spellbinders; Dew Drops from the Robin’s Nest. 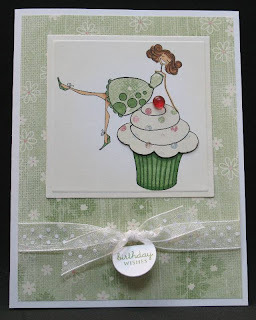 I think this might be my fave Bella card that I've made so far! I used more of my super old Kelly Panacci paper and I just love how that polka dot paper looks like a cupcake with sprinkles!! I stamped Cuppacakeabella on Georgia Pacific white cardstock and the patterned paper with black Brilliance ink. I colored a little with my Copics and drew over all the dots on the cupcake top with a clear Spica glitter pen. I also colored the cherry with a red Spica glitter pen, then glued a red Dew Drop over that. In real life, it really sparkles! The tag tied in the May Arts ribbon is a Cuttlebug diecut and the sweet little sentiment is from the Papertrey Ink set Mixed Messages. I really love how the small size is a perfect fit for the tiny tag. 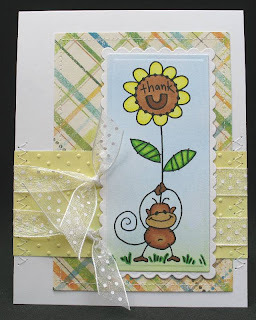 The sentiment was stamped with Stampin' Up! 's Old Olive ink. And of course I cut out the focal image with my Nestabilities. Finally, you can't really see it on screen, but I airbrushed a very light cream color around the edges of the white square to soften it a bit. It took me about 3 nights to get them done, but it was worth it! I love how they all turned out, and with the sketch from Sheetload of Cards, it wasn't that hard to design them at all! I'm not one to normally mass produce cards so I made 2 of each design to keep from getting bored! Billboardabella: First I stamped all the images, then I airbrushed a really light creamy color around all of them to take away the stark white edges. Next I colored them in with my beloved Copics, and then did some paper piecing on all of them using some really old Kelly Panacci paper I have, but still love. Some really old Primas completed the sketch. I'm so proud of how I've been using my massive old stash lately! I always say if I love something, I'll eventually use it and it's definitely been proven true! You'll notice on Billboardabella I changed up the materials just a bit. She just didn't look right with that dark pink cardstock so I just added more of the coordinating Kelly Panacci paper and a bit of Papertrey ribbon. Hope you like them! Other materials used: white cardstock - Georgia Pacific; Rose Red cardstock - Stampin' Up! 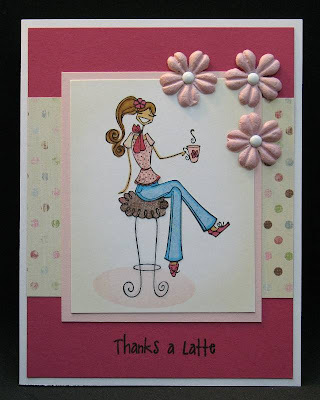 ; blue patterned paper - My Mind's Eye; black Brilliance ink - Tsukineko; "thanks a latte" - My Favorite Things' Hot Stuff set; "thinking of you" - Papertrey Ink's Simple Little Things Limited Edition set; white brads - Pink Hedgehog Papercrafts. 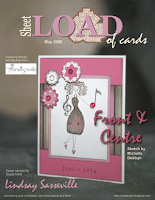 This month, Sheetload of Cards is featuring Stamping Bella!! Of course you all know how much I ADORE Bellas, so I want you all to go check it out! Here's the direct link to the May Issue. I hope to be able to share a sheetload of Bellas with you all soon!